Summary: Winston Wong’s first case looks like an easy one. The beautiful Carmen Solstice requests that he investigate the death of an old man in a senior living home in order to convince her demented grandmother what everyone else already knows: Joseph Sawyer died of natural causes. But, Sweet Breeze Residential Care Facility houses more secrets than seniors. As Winston uncovers hidden tools and encounters people with untapped talents and treasures, he needs every ability he developed as a gamer and game tester as he embarks on his new career as a sleuth. Thoughts: Seniors Sleuth is a cozy mystery that offers the quirky characters, fun plot twists, and intriguing settings that I love in that genre. In this case, the plot joins two environments that we don’t normally see together — elder care and video gaming. Neither are particularly familiar to me, but I loved the juxtaposition and the opportunity to learn about both. 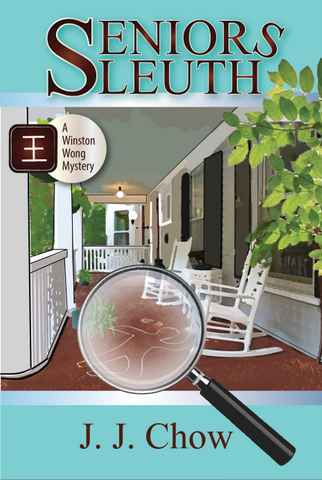 Appeal: Seniors Sleuth will delight cozy mystery readers with a setting that is a bit out of the ordinary realm for the genre. Challenges: Seniors Sleuth, featuring an Asian-American protagonist, is my third book for the Diversity on the Shelf Challenge. Today is the book birthday for Seniors Sleuth. Congratulations, J.J.! Don’t miss my interview with the author from earlier this week. I think it’s charming and refreshing that seniors and video gaming would be intertwined! Makes me want to read it more actually. Thanks Joy! Two subjects that wouldn’t normally go together. It sounds fascinating. Seniors and video games are not two things I would usually put together. Although I do think my husband will still be playing them when he’s a senior.